How To Make The Best Ham Salad – In other words, how to turn leftover ham into ham salad! As in the extra ham from the ham bone bean soup experiment. 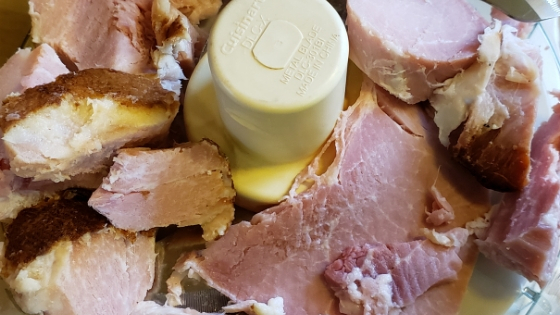 I don’t know what the Honey Bake Ham® ham salad ingredients are but I can draw from what I consider to be the best tasting vintage ham salad recipes. You would be surprised at the number of variations there are for a simple recipe with so few ingredients. 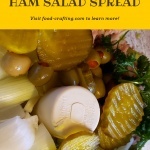 There is a ham salad recipe with horseradish (I can see that) but also a popular version with a dark cherry topping! I’ll pass on that version. 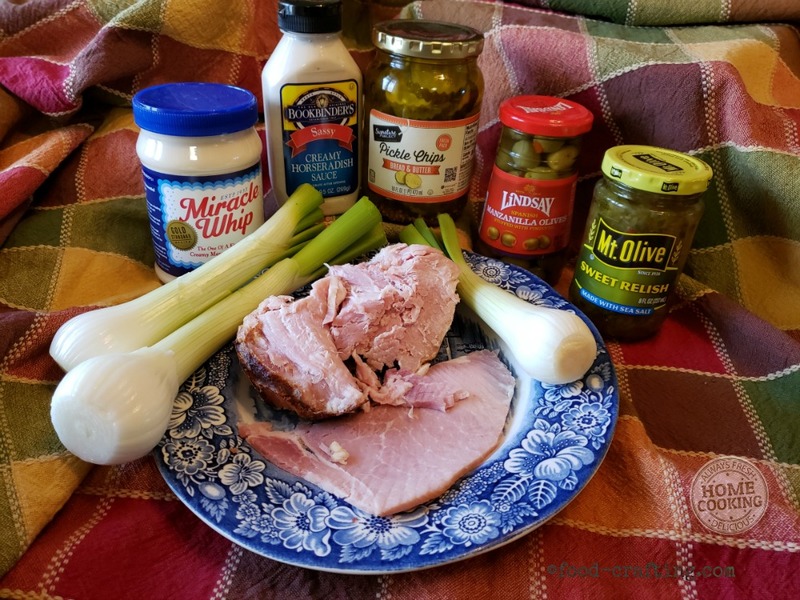 Before we explore various ingredients, the different recipes below are for a ham salad sandwich spread. A simple sandwich spread. 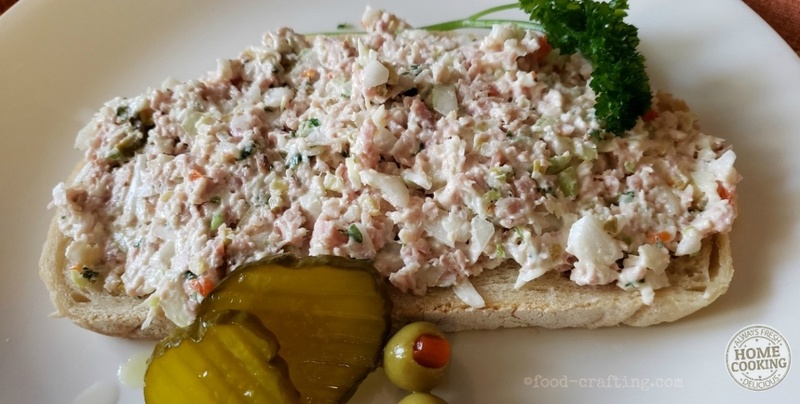 This is the type of ham salad to spread on an open face sandwich, spread on crackers as an appetizer, or use to fill an avocado for a light meal. What will you add to the salad? Pickles, relish, horseradish? Pick a version you prefer and let’s assemble a great ham salad recipe! A ham sandwich is a perfect side for a steaming hot bowl of vegetable soup. 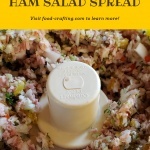 Homestyle ham salad made with leftover Honey Baked Ham®. 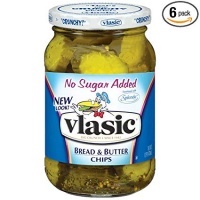 Prepared with young Vidalia bulb onions, bread and butter pickles with sea salt, Spanish olives, and Hellman's® mayo. Cut ham into medium chunks, onion bulbs in half. In the food processor (using a metal blade) add the ham chunks and process into smaller bits using two or three pulses. The ham will be reduced to smaller bits in the next step. Add the onions, pickles and olives. Turn into a medium sized bowl. Add preferred mayonnaise to taste. 2, 4 or 6 eggs depending on quantity of ham and desired proportions. Spread a very thin layer of mayo on the slice of bread. There are so few ingredients in the recipe that one might imagine a general consensus as to what belonged in the mix. No. Not even close. 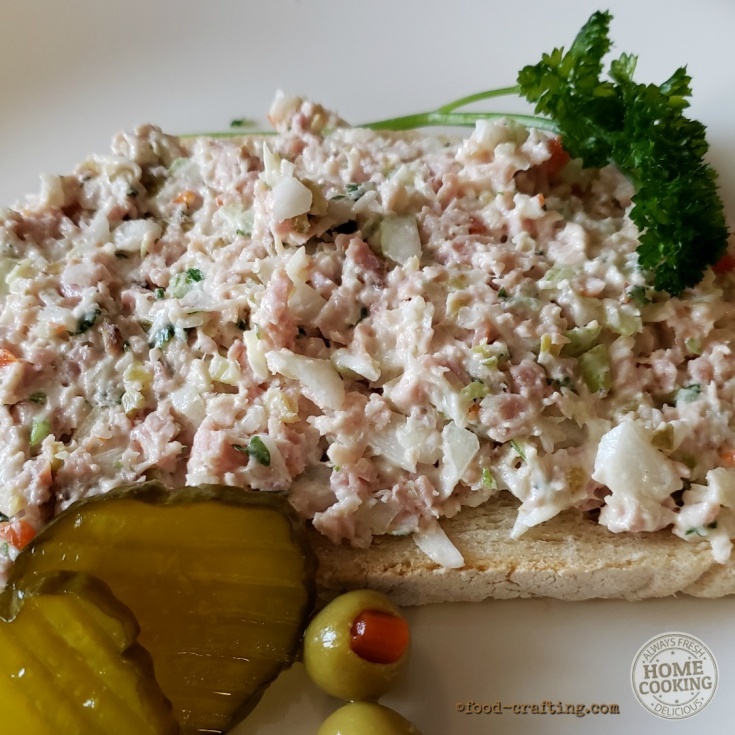 After reading through countless vintage recipe clippings for ham salad I find that every part of the United States has its own version with favorite local ingredients. 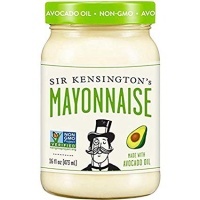 As with the selection of mayos, everyone has a favorite. But a cooked salad dressing is not something I would personally make. 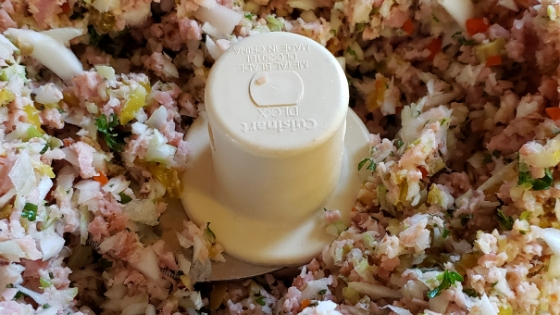 It certainly was popular – once upon a time – as I find multiple variations of this type of dressing in my mother-in-law’s recipe clippings. Her mother Lydia used them to dress salads destined for their Saturday morning farmer’s market table. Heinz® makes the closest thing to the old-fashioned cooked salad dressing. Bottled convenience. Here is a vintage recipe for a cooked salad dressing – just in case. On occasion, I add chopped hard-boiled eggs to an old fashioned potato salad. Or else, I garnish the bowl of potato salad with chopped scallions and wedges of an egg or two. 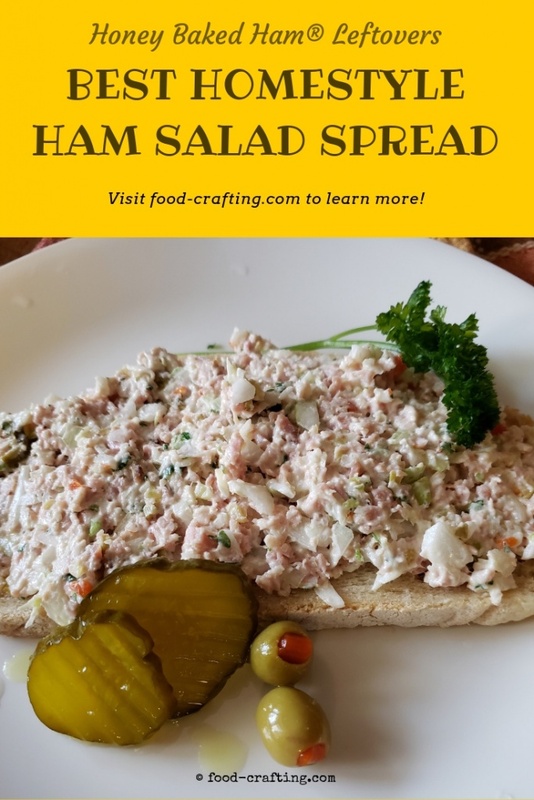 I’ve never added them to ham salad because I nearly always make it as a sandwich spread not a “salad” as in potato or chicken salad but it seems to be a popular variation. Combine the chopped ham and celery evenly. 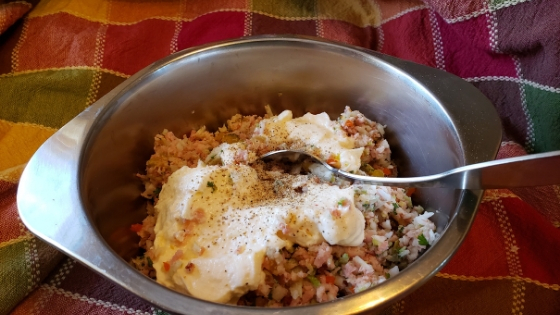 In a small bowl, combine the sour cream, the mayonnaise, and the horseradish. Season with a little salt and freshly cracked pepper. Fold into the ham mixture. To serve as a salad, place whole Romaine leaves on a plate. Top with a quantity of ham salad and garnish with hard-boiled eggs, pimento stuffed olives or a spoonful of hot Giardiniera. Giardiniera Italian Mix pickled vegetables also make a nice flavor addition. It’s time to break out the food processor. I usually make egg salad in relatively large quantities so this makes it super quick. Remember to mix in the sliced eggs. Do not run them through the processor. I keep a bag of hard boiled eggs in the fridge for snack attacks. 4 hard-boiled eggs, sliced. Set aside. 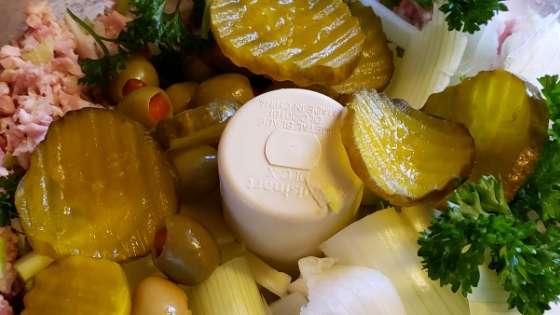 Place the ham chunks or slice (cut into several pieces) in the food processor along with the pickles, scallions and celery. Adjust the amount of pickles etc. to taste. Give the processor a few quick pulses to chop up the food. You want tiny dice not mush. Stop and redistribute the food so it all gets chopped evenly. 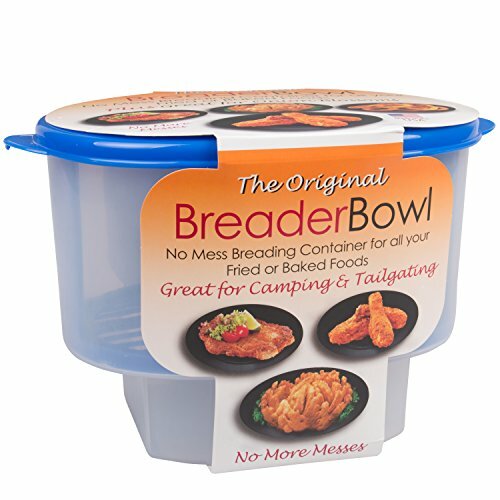 Turn into a medium sized bowl. Add mayonnaise to the desired spreading consistency. Carefully fold in the eggs. Need to make ham salad sandwiches for a crowd? A family picnic or reunion, a club meeting or a similar event? 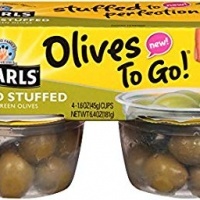 With vegetable sticks, a fruit and a bottle of chilled water, these are perfect for a day camp lunch. Keep well refrigerated. Here are the proportions to make 25 servings or 4 dozen sandwiches. 2 or 3 tablespoons of parsley and onions. 1/2 to 3/4 cup of salad dressing or mayo of your choice. For extra color, add 1 or 2 tablespoons of pimento bits (drained and dried on a paper towel) – optional ingredient. Mix all together and refrigerate until ready to serve. We already know the ham is salty so go easy on any added salt. Taste the ham salad and adjust as needed. Let the pepper do the seasoning. I’ve noticed that the nutritional facts calculated by the recipe card never seem to jive with the Online Calorie Counter. Regardless of the calculations, the ham is the real culprit here adding up to 900 calories to the ham salad. Next comes the mayonnaise. According to my food diary, a serving of the ham salad equals 237 calories. I can deal with that. Sodium? I decided not to add any to this recipe but that is entirely my choice. When the DH is not looking, I sneak in an organic mayo but his taste buds are stuck on Hellman’s®. Because “it’s real mayonnaise”. So are the added calories and pounds around the waistline.